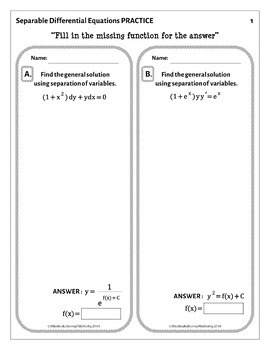 In this engaging and self - checking activity students will practice finding general solutions to 12 differential equations. The problems are of various difficulty and require using separation of variables and integration. There are 12 task cards – recording sheets with space provided for students to show their work. 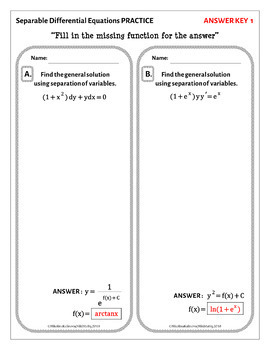 After finding the general solution, students must fill in the missing function f(x) for the answer given coded at the bottom of the card. The product is great for independent practice and it is appropriate for cooperative work as well. It can be possibly used as a partner or a group activity. Please study the preview images to ensure you understand what you are purchasing. If you have any questions about the product please contact me before purchase. If you enjoyed this product please leave a four star rating ****. I STRIVE TO PROVIDE YOU WITH THE BEST PRODUCT POSSIBLE. If you don't feel it's worthy of four stars please let me know what I can do to improve this product by being specific in your feedback. This way I can make this product the best it can be. 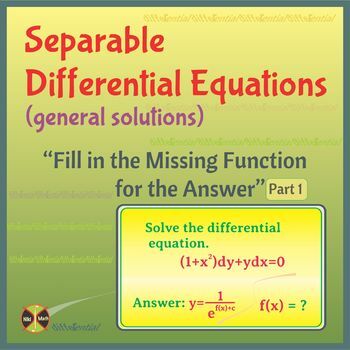 ➻ AP Calculus 1 & 2 BIG Growing BUNDLE -Limits, Derivatives, Integrals, Differential Equations, Series (over 1000 problems) - 56 products included and discounted at 32% !